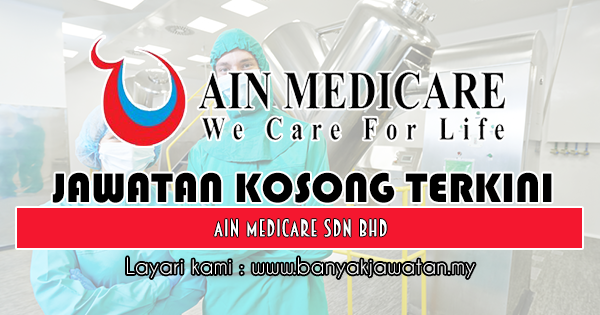 Established in 1993 in Malaysia, AIN MEDICARE SDN. BHD. is a trusted name and leading manufacturer of pharmaceutical products ranging from Large Volume Parenterals, Small Volume Parenterals, Irrigation Solutions, Haemodialysis concentrates and Peritoneal Dialysis solutions. A wholly-Malaysian owned company located in Kelantan, on the East Coast of Peninsular Malaysia, WE operates from a multi-million dollar state-of-the art pharmaceutical complex fully equiped with production floor, microbiological and chemical laboratories, warehouse and administrative center. 1 Response to "Jawatan Kosong di Ain Medicare Sdn Bhd - 28 November 2018"